Corry Micronics offers three main types of power dividers. These power dividers are the Wilkinson style, N connector communications power dividers, Broadband and Ultra-Broadband, SMA connector style and the reactive type power dividers. The communications type power dividers are offered in 2, 3 and 4 way configurations with a forward power rating of 30 Watts. The frequency range is from 800-2,500 MHz. Designed for indoor use, the dividers are Wilkinson type, offering high port isolation and multi-octave bandwidth making them ideal for use in a variety of microwave applications including multi-band antenna use. Power divider outputs are well-matched in phase and amplitude. These dividers can also be used as power combiners at reduced power level, into a matched load. The second type of power dividers are the broadband and ultra-broadband styles covering frequencies from 500 MHz to 18,000 MHz. These power dividers are available from the 2 way to the 8 way power divider. These units are small in size and light weight making them ideal for use in systems requiring a wide bandwidth, low insertion loss and excellent isolation. Although physically small they are capable of handling 20 Watts when used as splitters or up to 3 Watts when used as combiners into a matched load. The third series of power dividers are the reactive power dividers. The reactive power dividers are offered in configurations of 2, 3 and 4 way dividers. The reactive style can be ordered with BNC, TNC or SMA connectors. Ideal for driving antenna arrays and other microwave applications requiring high power and no output port isolation. These dividers are rated at 200W with a peak rating of 3KW. Their low insertion loss enables efficient power transfer. The reactive power dividers are not intended for use as power combiners. 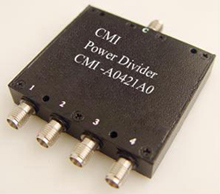 For high power combiners refer to the CMIPC-101 series of high power hybrids. Custom designs are available with a minimum order commitment.